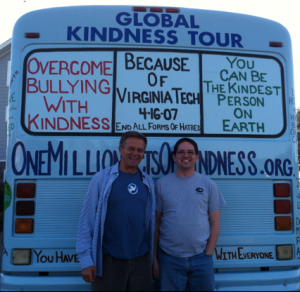 In a very short while, the Kindness Bus will finally be shipped from Petaluma, California to Blacksburg, Virginia. Professor Bryan Katz will use it on the Virginia Tech campus and surrounding Blacksburg area for years to come. I was able to spend time with Bryan, his wife Katie and their family and have Easter dinner in their home. I knob that the Kindness Bus is going to be put to good use. This entry was posted on Sunday, April 20th, 2014 at 9:02 am	and is filed under Kindness. You can follow any responses to this entry through the RSS 2.0 feed. You can leave a response, or trackback from your own site.